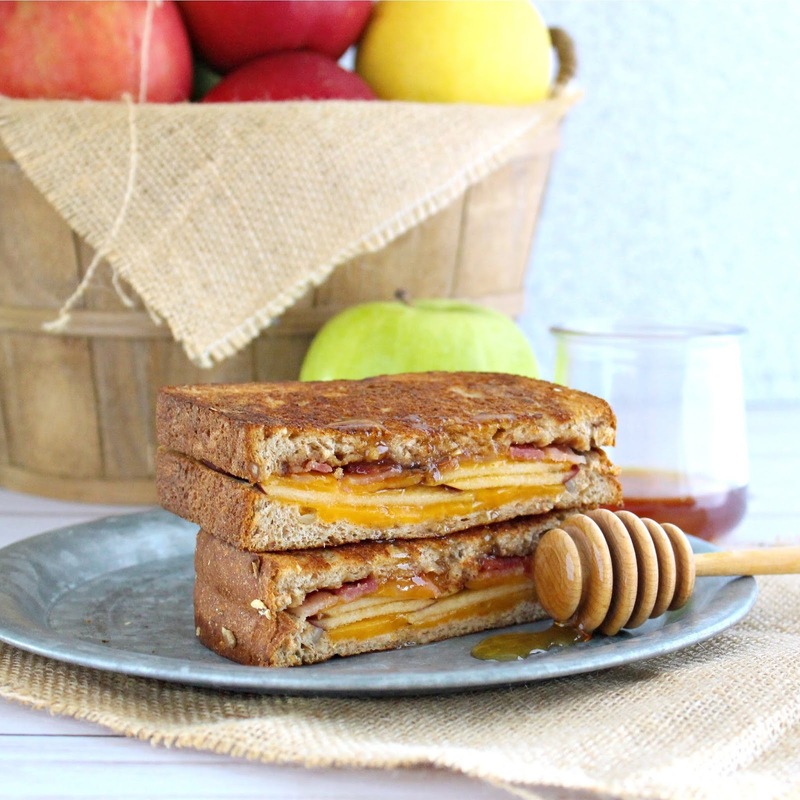 The best Fall flavors are combined into one sweet and savory sandwich – Harvest Apple Grilled Cheese! Cheddar, apples and bacon are sandwiched between 15-grain bread for a hearty Autumn dish. 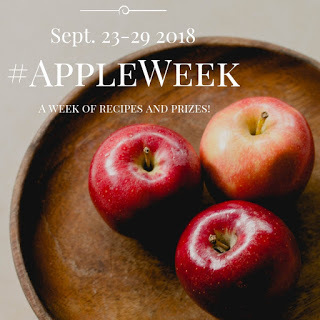 This post is sponsored in conjunction with AppleWeek. All opinions are mine alone. Many years ago, Mr. L&C and I shared a Harvest Apple Sandwich from one of the local food trucks, and it was amazing! Sadly that truck is no longer in operation, so I decided to try and recreate the bacon, cheddar, apple grilled cheese goodness on my own. 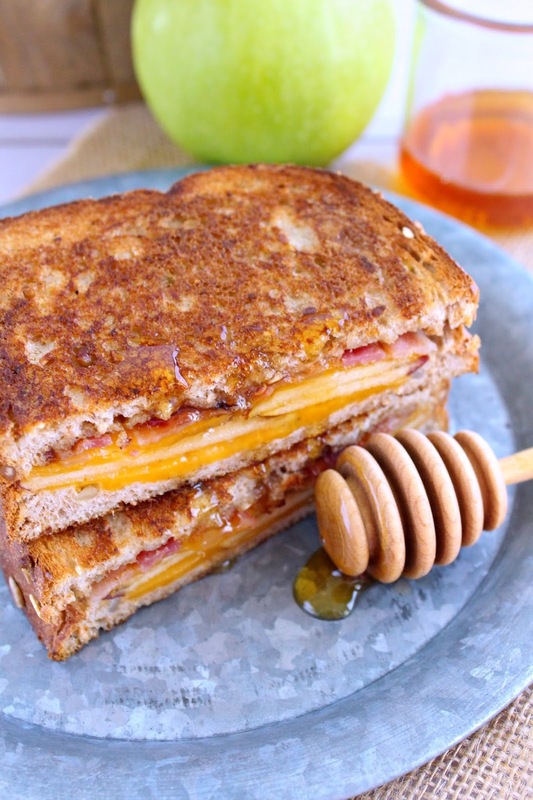 While it may not be exactly how we remembered, this grilled cheese is a delicious Autumn treat! I have always loved a sweet and salty combination – the best of both worlds. 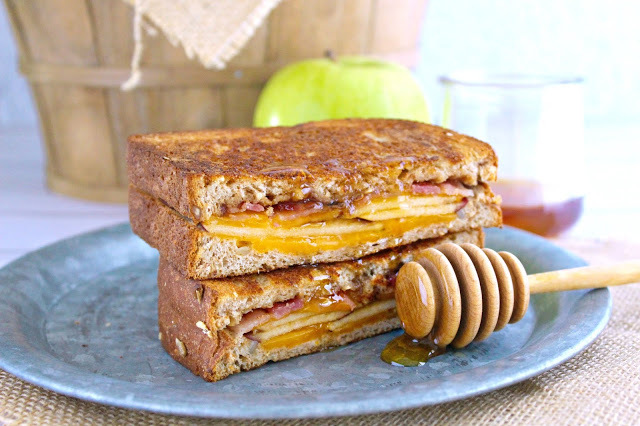 When building the sandwich, apple butter is spread on the inside of a slice, then topped with bacon, cheddar, apples and more cheddar, then cooked and drizzled with honey. The honey is totally optional, but I love that added touch. Sweet, salty, creamy, crunchy all combine to create the perfect Fall sandwich. I bet you could even add some caramelized onions for a great flavor combination. You can also choose the sweetness of apples – Honeycrisp, or similar, if you want a sweeter apple; Granny Smith if you want that crisp, tart bite. Either way, they are both delicious. Make sure you have a good cheddar! None of that individual plastic-wrapped cheese please. go to your deli counter and get the best cheddar you can, or head to the refrigerated section and pick up a brick and slice your own. 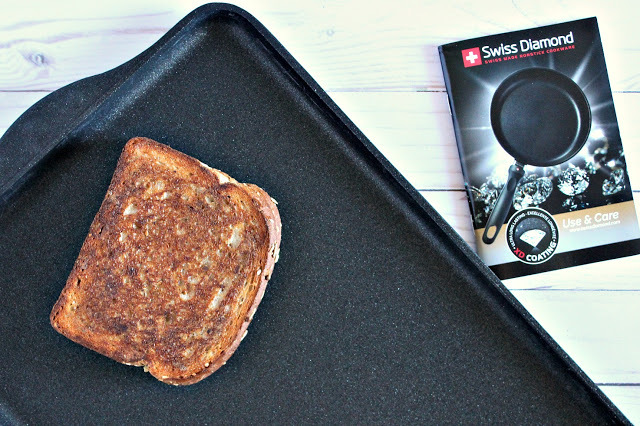 When it comes to cooking, I am thoroughly impressed with this Swiss Diamond Cookware Double-Burner Griddle. I can cook multiple grilled cheese sandwiches at the same time, and it makes breakfast a breeze with the surface area for pancakes and French toast! 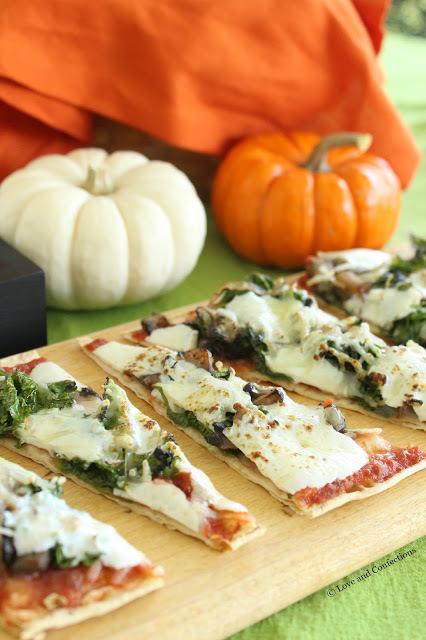 Head to the Swiss Diamond Facebook page for more recipe information. 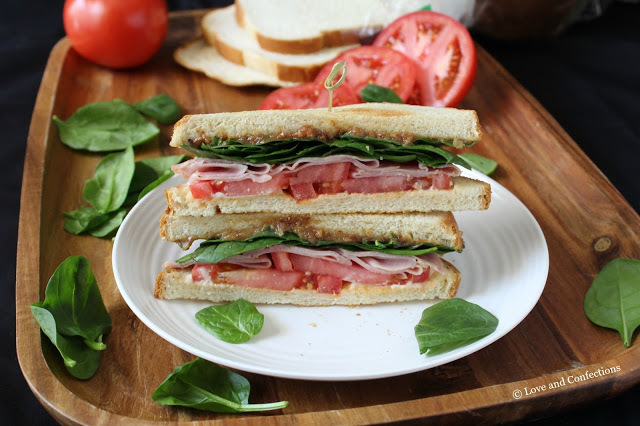 Bacon Jam & Ham BLT is a delicious and easy sandwich made with only 6 ingredients! 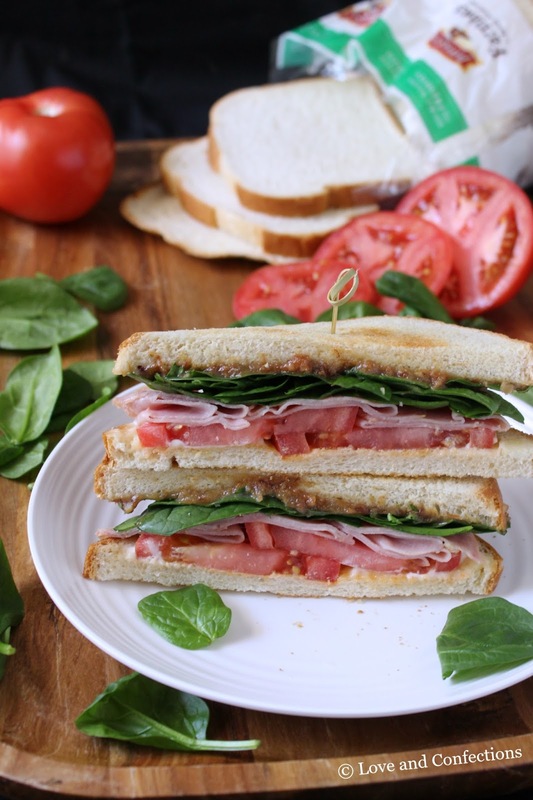 Toasted Pepperidge Farm Farmhouse™ Hearty White, Hillshire Farm® Thin Sliced Honey Ham, Hellmann’s® Real Mayonnaise, tomato, spinach and bacon jam are sandwiched to make the perfect twist on the classic BLT. I have a love of BLT’s from childhood, and always enjoy them when I want an easy and delicious sandwich. Today, I am re-working mine to include my 6 favorite ingredients. 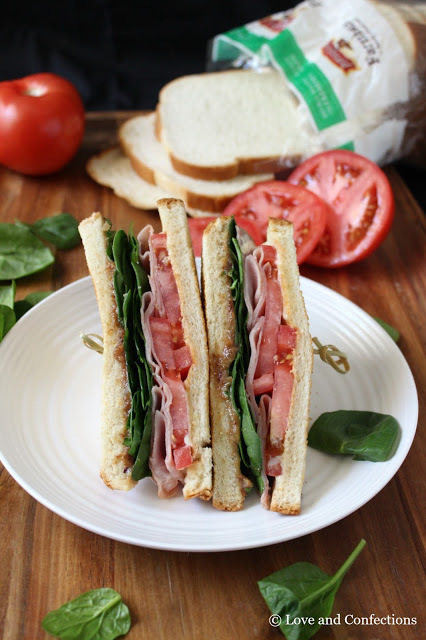 With bread as a vessel for all the BLT deliciousness, you can’t start a sandwich without quality bread, like Pepperidge Farm® from the bread aisle at Walmart. I love Farmhouse Hearty White because it is slow baked, crafted from a small batch recipe, and uses wholesome ingredients. 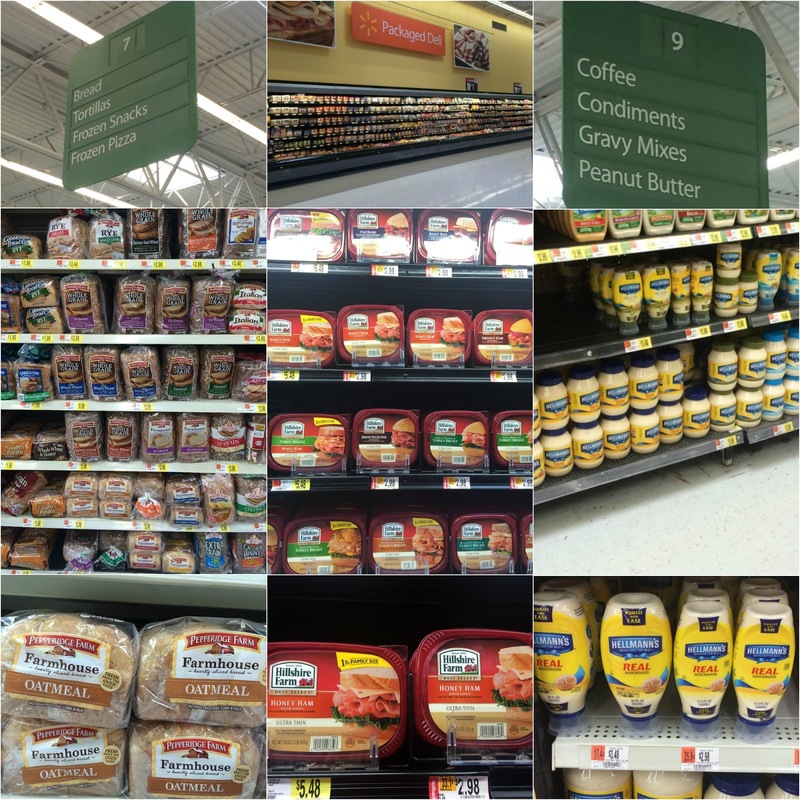 In the salad dressing aisle at Walmart, I found Hellmann’s® Real Mayonnaise. It is made with real, simple ingredients, like eggs, oil, and vinegar. I love using it to amp up my sandwiches by mixing it with fun flavors too. Hello, bacon jam mayonnaise is coming my way soon! 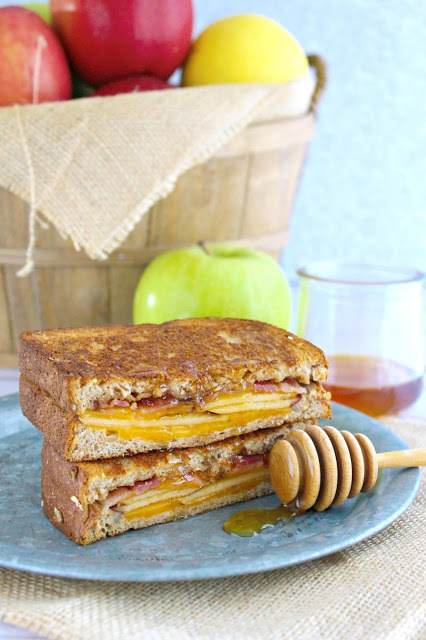 Hillshire Farm® Thin Sliced Honey Ham is slow roasted for hours, has the perfect amount of sweetness with premium quality honey, and has no artificial flavors or by-products. 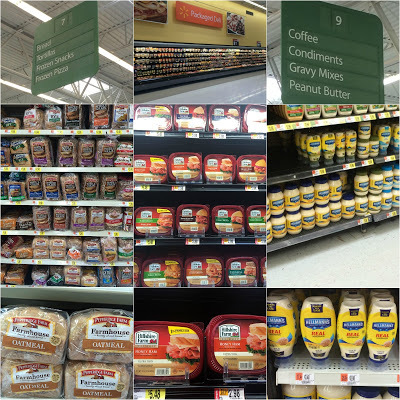 Look for Hillshire Farm® Thin Sliced Honey Ham in the packaged meat section at Walmart. B: Crispy bacon is usually a must, but sometimes I don’t feel like baking or frying bacon. That’s where bacon jam comes in. If you’ve never had bacon jam, you need to get your hands on some immediately! It is the perfect spread, in addition to the Hellmann’s® Real Mayonnaise, and gives such great bacon flavor while helping to hold the sandwich together. L: While I love lettuce and eat it regularly, spinach is a great option and totally different twist for this sandwich. The deep green leaves taste great with everything and are really pretty when you look at the cut sandwich. Plus, since the leaves are flatter, the sandwich stays together better. Come on, I mean we are talking serious sandwich construction and engineering here, lol. Also, those fun little cocktail picks help hold your sandwich together too. T: A BLT is nothing without the tomato. I love having tomatoes on all my sandwiches, with the exception of peanut butter and jelly. Grilled cheese, Italian, tuna, you name it and I have a tomato on that sandwich. Make sure your tomato is nice and ripe, and cut in about 1/4-inch pieces – not too big and not too small. When layering my sandwich, I place Hellmann’s® Real Mayonnaise on the inside of both pieces. Bacon jam goes on one side and tomatoes on the other. Spinach on top of the bacon and ham on top of the tomatoes. Sandwich it together and cut it diagonally, because that is a pretty cut, but you can also cut it straight across – I won’t judge. Bacon Jam & Ham BLTs are perfect for any day of the week when you are in a time-crunch but want a delicious meal. 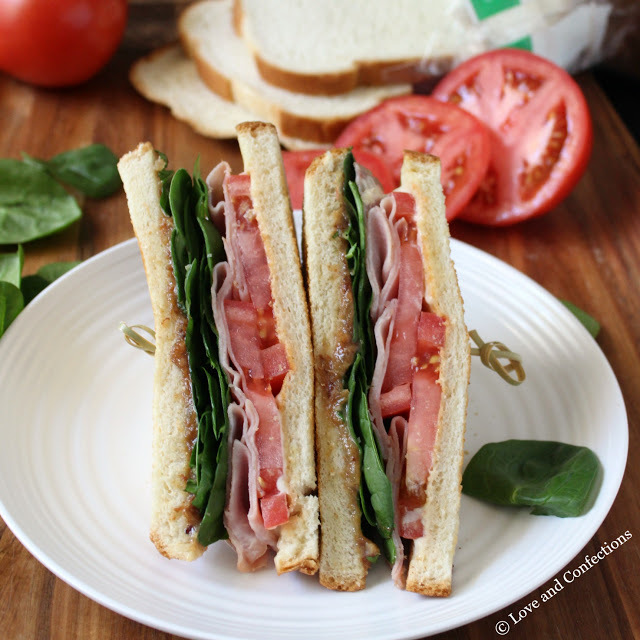 Here are more creative sandwich ideas from Pepperidge Farm®. You might also like my Monte Cristo Grilled Cheese, made with Pepperidge Farm Farmhouse™ Oatmeal bread, Hillshire Farm® Thin Sliced Honey Ham, and Hellmann’s® Real Mayonnaise. Toast bread. Spread mayonnaise on the insides bread. Spread bacon jam on one side. Layer spinach on top of bacon jam. 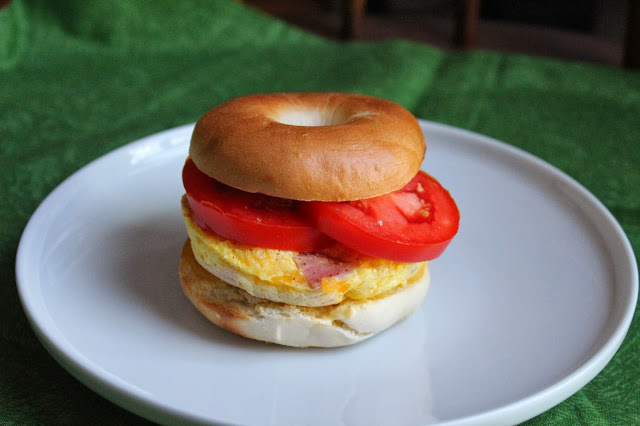 On the other slice of bread layer tomatoes then ham. Sandwich together, cut, and enjoy! 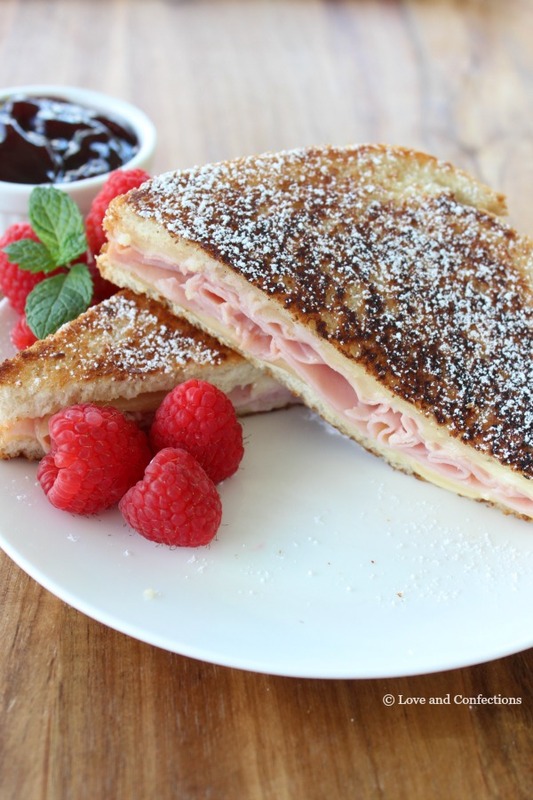 Monte Cristo Grilled Cheese is a delicious and easy sandwich made with only 6 ingredients! 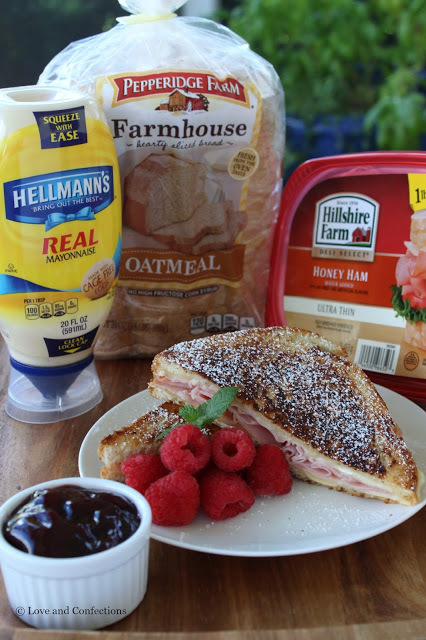 Pepperidge Farm Farmhouse™ Oatmeal bread, Hillshire Farm® Thin Sliced Honey Ham, Hellmann’s Real Mayonnaise®, and Swiss cheese are grilled to perfection, then served with raspberry jam and dusted with powdered sugar. 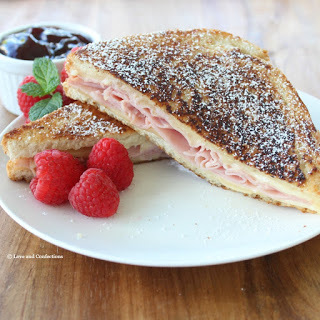 I first fell in love with the traditional Monte Cristo back in college. My friends and I frequented a restaurant, and the Monte Cristo was always the menu item I chose. While I love the traditional sandwich and its flavors, I don’t always have the time to fry it, like the original. My grilled cheese version is much easier and even more delicious. 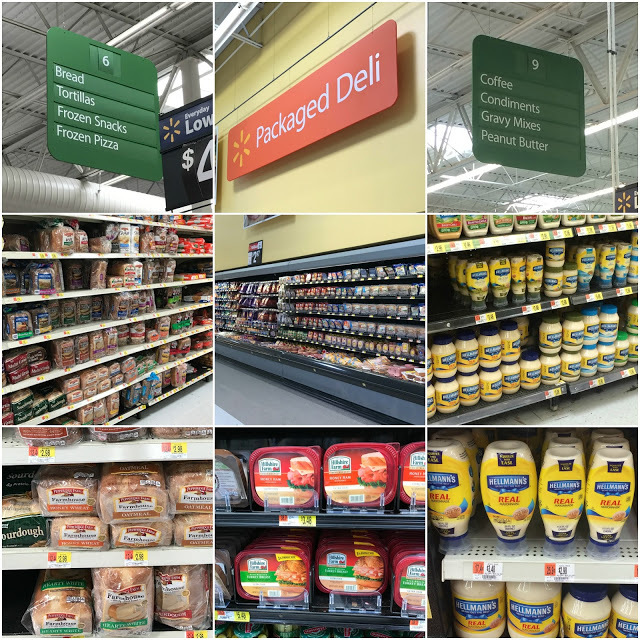 You can’t start a sandwich without quality bread, like Pepperidge Farm® from Walmart. I love Farmhouse Oatmeal bread because it is hearty, delicious and uses wholesome ingredients. Hillshire Farm® Thin Sliced Honey Ham is slow roasted for hours, has the perfect amount of sweetness with premium quality honey, and has no artificial flavors or by-products. Did you know you can use Hellmann’s® Real Mayonnaise on the outside of your bread to make a perfect grilled cheese sandwich? Hellmann’s® Real Mayonnaise is made with real, simple ingredients, like eggs, oil, and vinegar. I love using Hellmann’s® Real Mayonnaise to amp up my sandwiches by mixing it with fun flavors too. Swiss cheese is one of those cheeses I have to be in the mood for. I like it on Monte Cristo sandwiches and prefer Lacey Swiss or Baby Swiss for their milder flavor. You can use whichever kind of Swiss Cheese you like best. 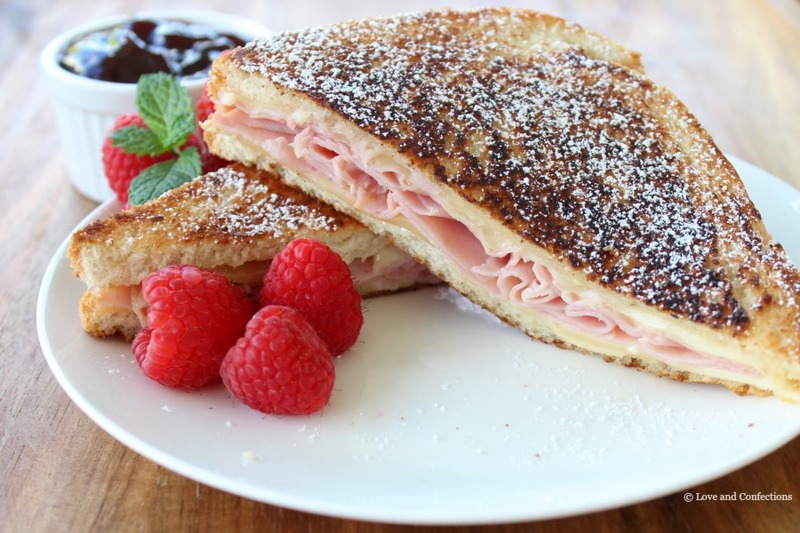 I always serve my Monte Cristo sandwiches with either a raspberry jam or raspberry sauce. The tart-sweet combination works perfectly with the savory sandwich. Dust with powdered sugar for a restaurant-worthy presentation! 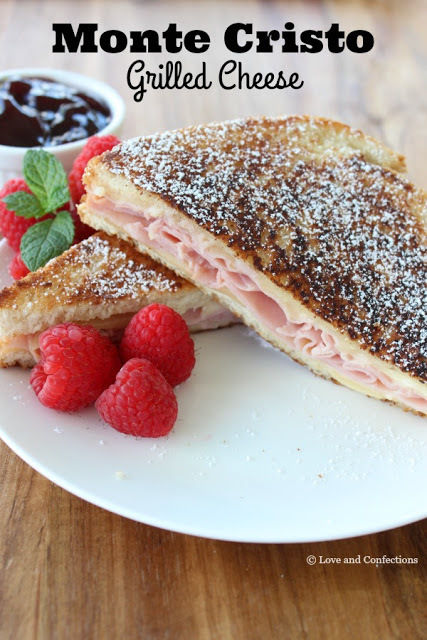 Monte Cristo Grilled Cheese Sandwiches are perfect for a weeknight when you are in a time-crunch but want a delicious meal. Here are more creative sandwich ideas from Pepperidge Farm®. Heat skillet on medium. Spread 1 teaspoon Hellmann’s® Real Mayonnaise on each side of each slice of bread. Cook until golden brown, then using a spatula, flip so the other side of the sandwich can brown. 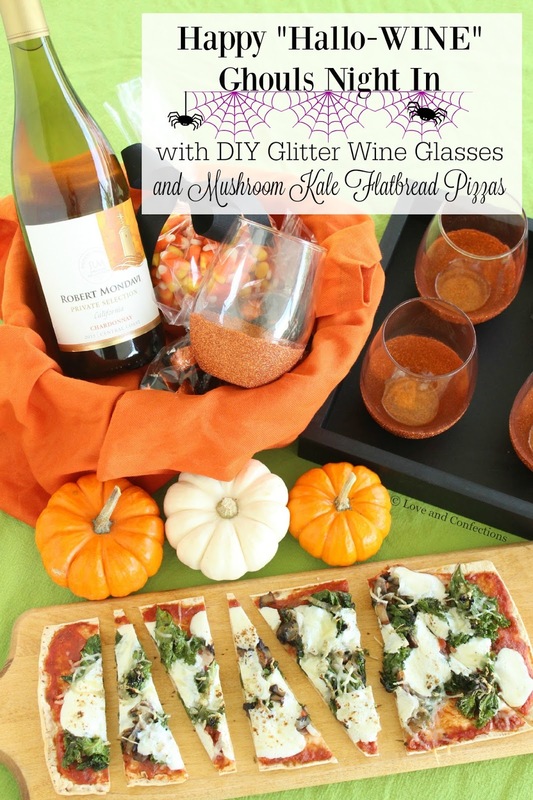 DIY glitter wine glasses, delicious Mushroom and Kale Flatbread Pizzas, and a bottle of Robert Mondavi Private Selection Chardonnay along with some treats for my girlfriends, create a Happy “Hallo-WINE” Ghouls Night In. I absolutely love Halloween, but for my girlfriends and I it is usually geared towards our little ones. We try to have a girls’ day every couple of months for us to hang out and spend time together. Sometimes we get so busy with our everyday lives and work that we need to schedule a day just for us. 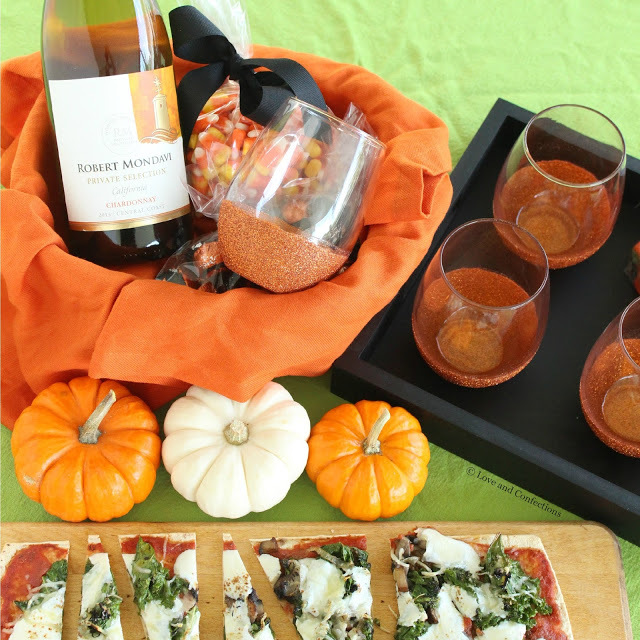 With the help of Robert Mondavi Private Selection Chardonnay, I planned a Halloween “Ghouls Night In”… get it? 😉 A chance for my girlfriends and I to relax and enjoy some good food and good wine. 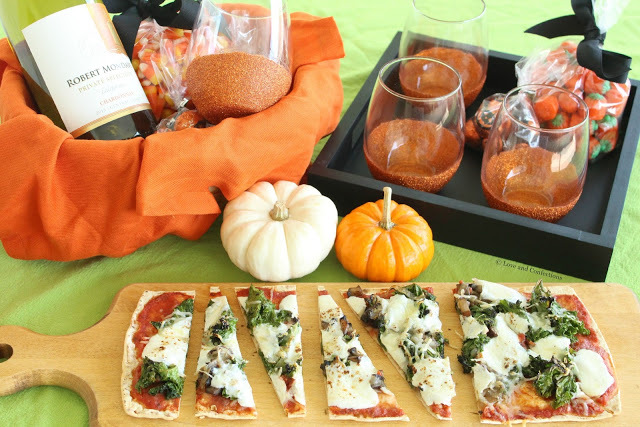 I made a cute little basket to display our treats – there can’t be a girls’ day without some dark chocolate – and created some delicious flatbread pizzas that pair perfectly with the Robert Mondavi Private Selection Chardonnay. My basket is based off the traditional “You’ve Been Boo’d” chain letter game played around Halloween. Friends, neighbors or co-workers anonymously leave a note and treat for someone and they in turn have to “boo it forward” to two more people. The chain keeps going so everyone in the neighborhood or office has been boo’d by Halloween. Robert Mondavi Private Selection Chardonnay is also a great idea for a host/hostess gift. Some bottles in stores have a hang tag with Mummy’s Mulled Wine recipe and message “You’ve Been Hallo-wined“. How cute is that?! Even better is the instant redeemable coupons and mail in rebates that are valid 10/1-11/30. Now, you can’t drink wine without cute wine glasses. I love getting crafty and decided to make each of my girlfriends their very own glittered wine glass. 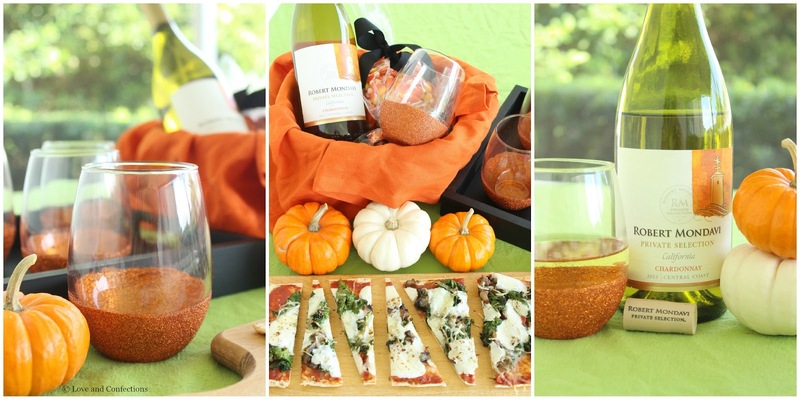 I chose orange, which is perfect for our “Hallo-wine” party and any day during the Fall season. It is easy to do (I created mine while the toddler took a nap) and a swanky idea for any Autumn-themed tablescape. Make sure the wine glasses are clean and the outside is wiped with rubbing alcohol. Gather all the supplies you need: paper plates, paintbrush, foil or newspaper, dishwasher-safe Mod Podge, ultra-fine glitter, and a small bowl. You can also use painters’ tape to create a very clean line. I free-handed mine and they turned out perfect. Place foil or newspaper on your work surface. Add Mod Podge into your small bowl. Using the paintbrush, paint a thin layer of Mod Podge according to whatever design you would like, and over a paper plate, sprinkle the glitter so it covers the glue completely. Gently shake it off and place the glass upside down to dry. Repeat with the other glasses and let them dry for 1-2 hours. While they are drying, rinse off the paintbrush and replace the excess glitter back into its container. Once the glasses are dry, gently repeat with another layer of Mod Podge and glitter. Let the second layer dry on all the glasses for 2 hours. Clean the paintbrush and replace and clean up the glitter. After 2 hours, paint a final layer of Mod Podge all over the glitter to seal it. Let it dry for a minimum overnight, but make sure to read the package directions for specific curing times. Be sure to follow Robert Mondavi on Facebook, Instagram and Twitter. 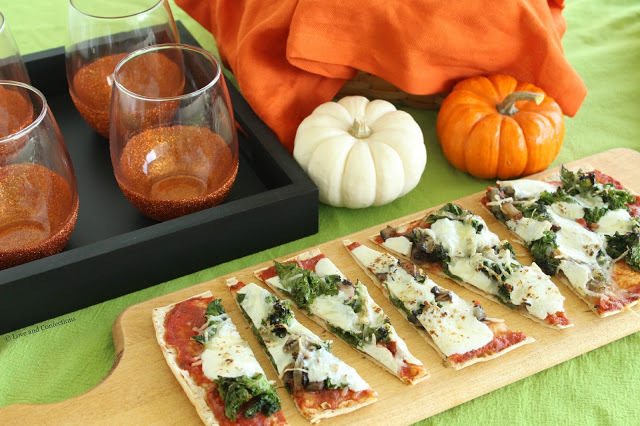 I shared my “Hallo-WINE Ghouls Night In; how you will “Boo it forward”? 1. Heat oven to 375F. Place a silicone mat or parchment paper onto a half-sheet jellyroll pan and set aside. 2. In a medium-large skillet, heat the Olive Oil and Butter and saute the Onion until translucent, about 5 minutes. Ad in the chopped Mushrooms and cook another 5 minutes. Add in the Kale and cook another 5 minutes until it has wilted and cooked through. Set aside. 3. 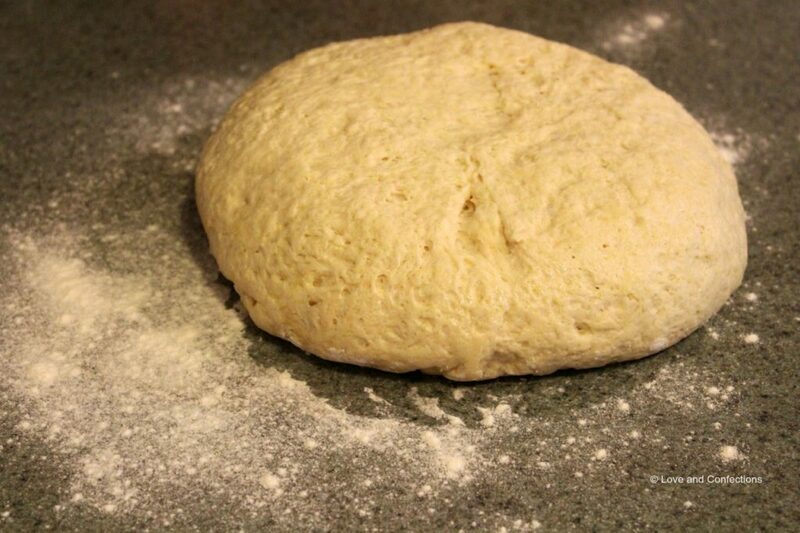 Bake the plain Flatbreads, per the package instructions, for 2 minutes, before adding toppings. Add 1/4 cup Tomato Sauce per flatbread and spread evenly. 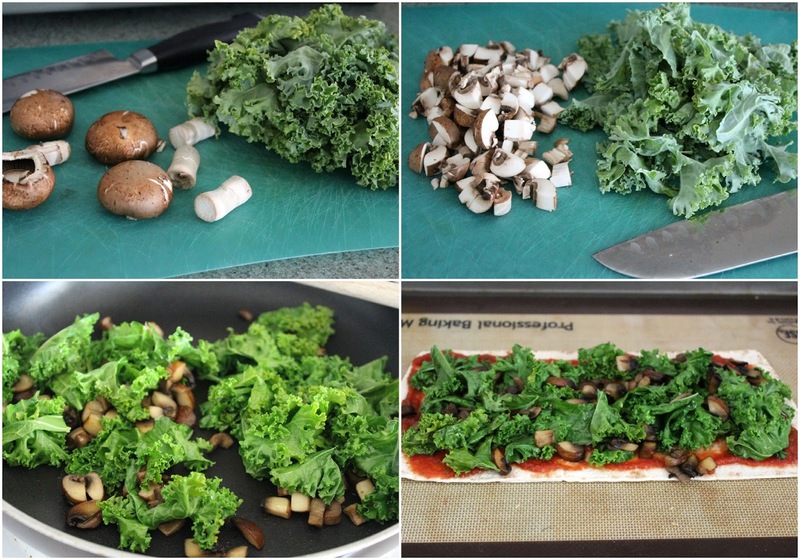 Top with mushroom and kale mixture. Break apart the Fresh Mozzarella and sprinkle it over the flatbreads. 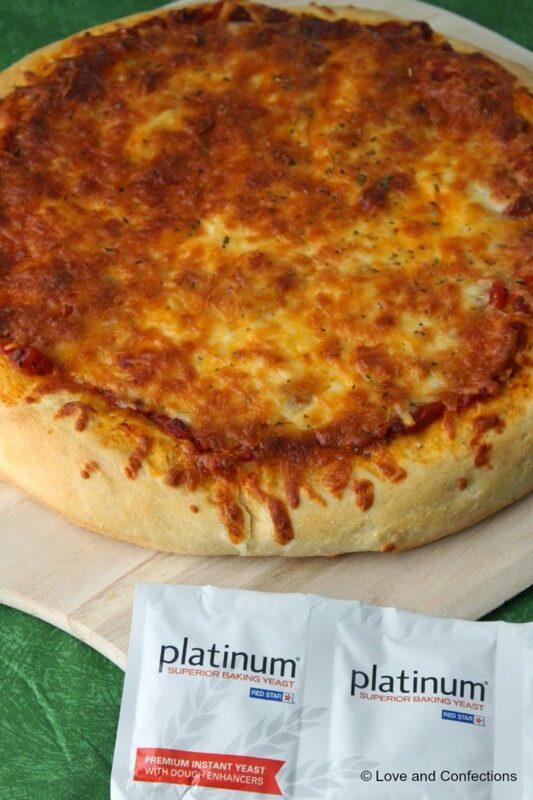 Evenly distribute the Parmesan Cheese on top. 4. 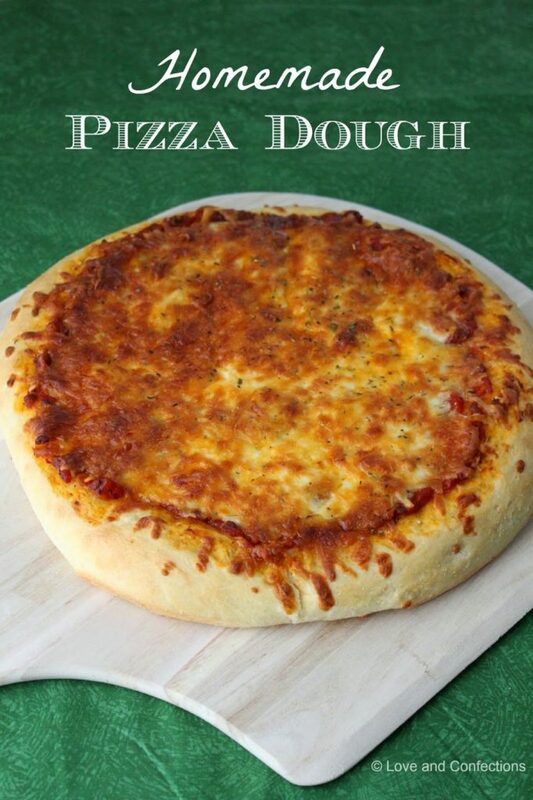 Bake for 6-10 minutes, or until the cheese is fully melted to your liking. 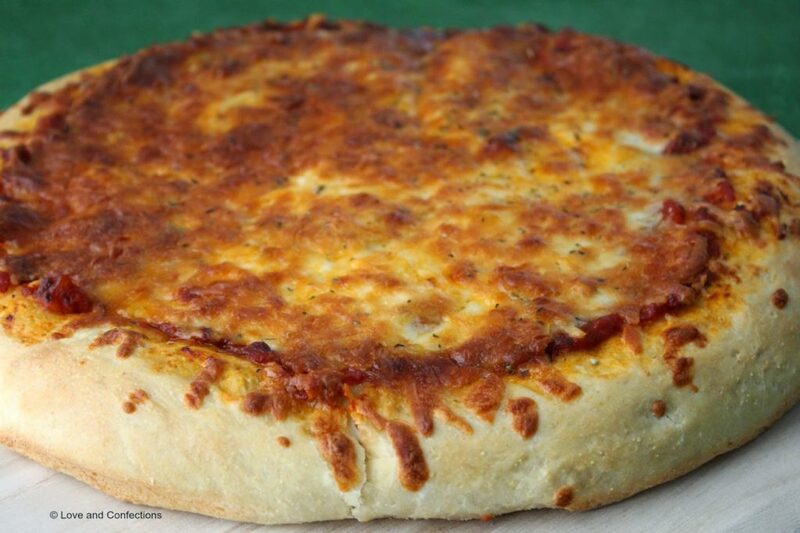 Remove pizzas from the pan onto a cutting board and slice. Serve with a glass of Robert Mondavi Private Selection Chardonnay and enjoy! 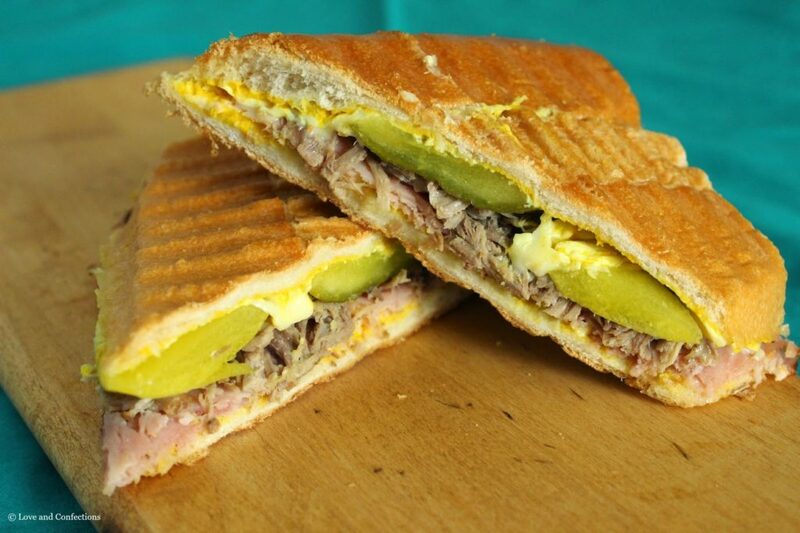 Pressed Cuban Sandwiches are one of my all-time favorite sandwiches. 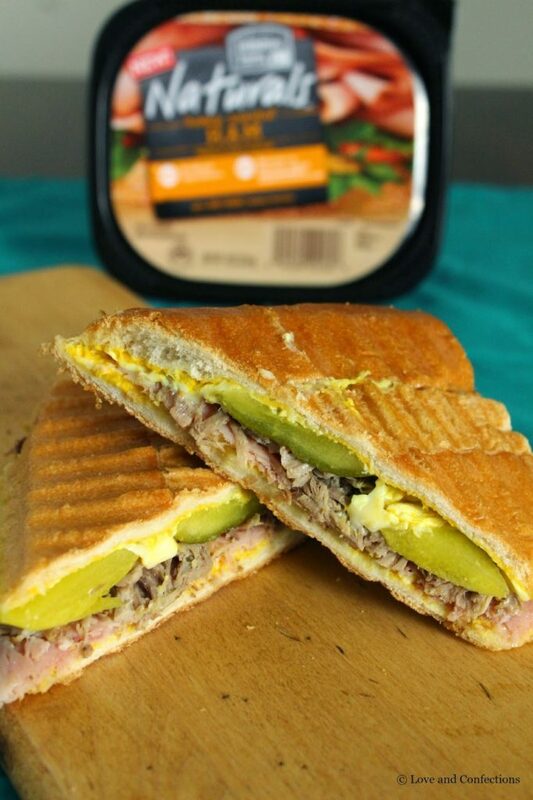 The Cuban bread gets a little crispy from the panini press, smeared with just the right amount of mustard, moist and juicy pork and ham, cheese and pickles round it out into a mouthwatering meal. I grew up in Miami, and even though I am not Cuban, I LOVE Cuban food – yes, so much that it needed to be in all caps! I could seriously eat it all, morning, noon and night. One of the most delicious breakfasts is Tostada Cubana – Cuban bread that is sliced, pressed and buttered, then you can dip it into your Cafe con Leche – simple and amazing. Croquettes and Pastelitos are perfect any time of the day. Cuban Sandwiches, Pan con Bistec, and Medianoches are perfect for a lunch break along with an order of Mariquitas or Yuca Fries. Dinner can be Vaca Frita, Ropa Vieja, or Churrasco and of course Maduros, Black Beans and Rice. I am seriously hungry right now! Let’s get back on track. I was craving a Cuban Sandwich a couple days ago and decided to make one with my panini press. Hillshire Farms Naturals lunchmeats were the perfect option for my sandwich. The ham tasted great, with a little bit of sweetness, and perfectly complimented my shredded pork. Instead of the usual sliced pork, I used some shredded pork that I had made the night before for barbecue (barbecue sauce left off, of course). I made a sandwich for Mr. L&C and my Dad, who each had Swiss Cheese. I chose White American because I like that flavor better – I know, not the traditional cheese, but I like it. I was very surprised, but Toddler L&C loved the Cuban Sandwich. She kept coming up to me and taking bites off of mine. She loves pickles and cheese, but I didn’t know how she would do with the mustard and ham. She loved it so much that she had Hillshire Farm Naturals Ham the next two days during lunch – which made this Mommy very happy. 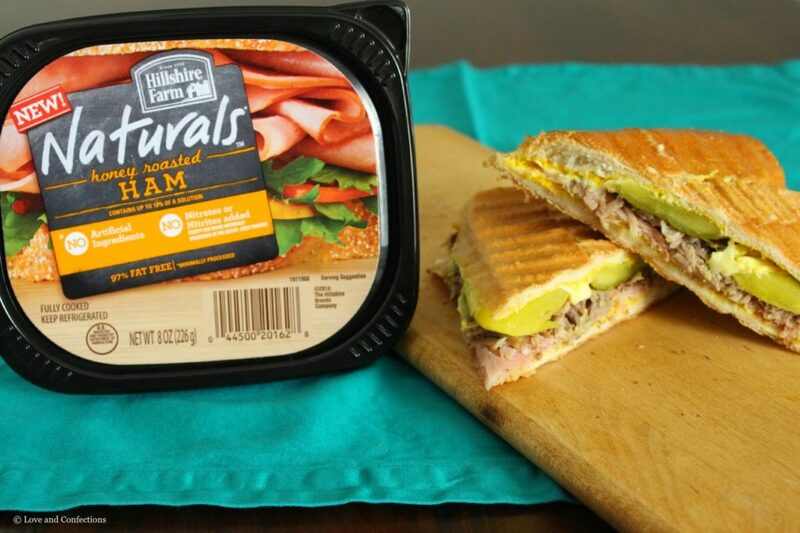 Hillshire Farm Naturals lunchmeats are crafted to be both 100% natural and 100% delicious, which is why they will provide a 100% refund for every package of meat that a consumer is not satisfied with – that is some seriously good customer service! The lunchmeat is always select cuts of meat and slow roasted in their own juices, creating a natural goodness. 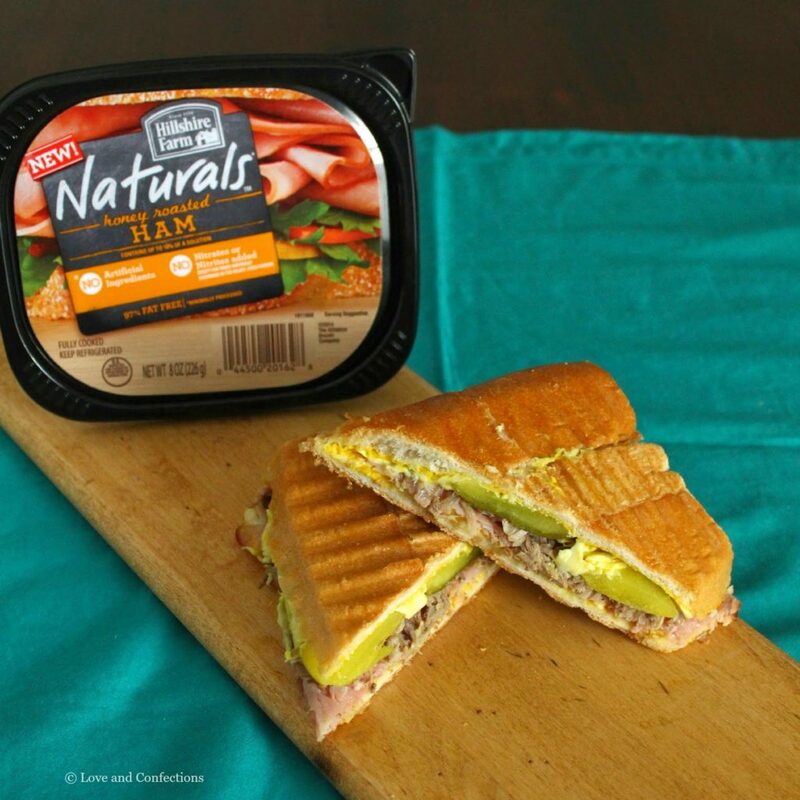 There are also no artificial ingredients or preservatives as well as no added nitrates or nitrites. You can learn more about Hillshire Farm Naturals here. The amount of ingredients is your own personal preference. 1. Heat your panini press according to manufacturer’s directions. 2. Slice Cuban Bread into 6-8 inch sandwich pieces, then slice each piece in half horizontally. Spread a thin amount of soft Butter on the bottoms of the sandwich before you build them. 3. Spread a thin amount of Mustard on each open-faced sandwich. Place a piece of Cheese on the bottom half. 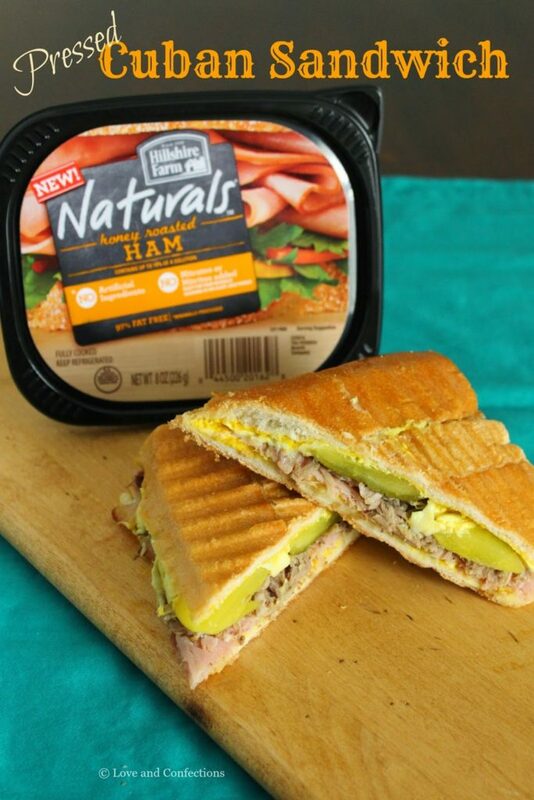 Place Hillshire Farm Naturals Ham Slices on the bottom half, followed by the Pulled Pork, then pickles and another slice of Cheese. Replace the top of the sandwich and spread with Butter. 4. Heat in the panini press until the sandwich is heated throughout and the cheese has melted. Slice in half and enjoy! Depending on what day it is, I may be a morning person. I mean, if necessary, I will wake up and be ready to go. Other times, I don’t want to wake up until it’s afternoon. Waking up late is a problem when you love breakfast as much as I do. I guess that it the beauty of Brunch – you can have it anytime of the day. Last month, my Dad got transferred here for his job and moved in with us. Mr. L&C, Dad and I are mostly adjusted to each other’s schedules – I haven’t lived with Family for 11 years. Dad wakes up for work earlier than we do, so he eats breakfast first. He asked if I could make these little egg “muffins” like my sister does up at home. I didn’t have any recipe to follow, but I think they turned out pretty darn good. KB uses muffin tins, but I think they turn out a little too tall for sandwiches. Dad bought mini bagels to use for the egg sandwiches and that gave me the brilliant idea to use a doughnut pan! I recently received a doughnut pan from King Arthur Flour to use. I love doughnuts – eating more than making, of course – and was wondering if I could use the pan for something other than just doughnuts (the donuts will be in an upcoming post). I like being able to use pans and utensils for more than just one task. This pan is perfect for not only doughnuts, but also for making these mini egg “doughnuts”. It bakes evenly and is a breeze to clean. The non-stick surface would have probably been fine just the way it is, but I used cooking spray just to make sure that the egg would come out perfect. This recipe is easy to adjust for quantity and add your own spin on ingredients. I am going to make my next batch with spinach and swiss, possibly also a tomato and mozzarella version too. 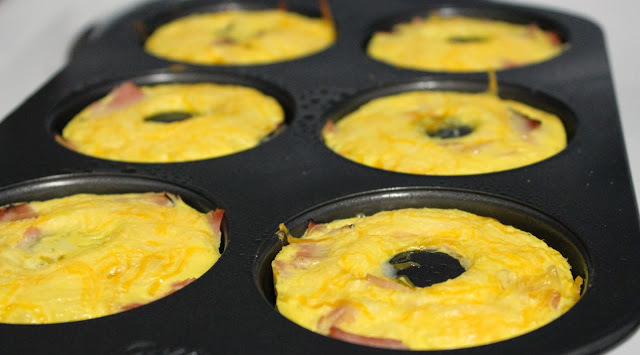 – Cut the Ham into small pieces/cubes and equally distribute in the doughnut pan cavities. 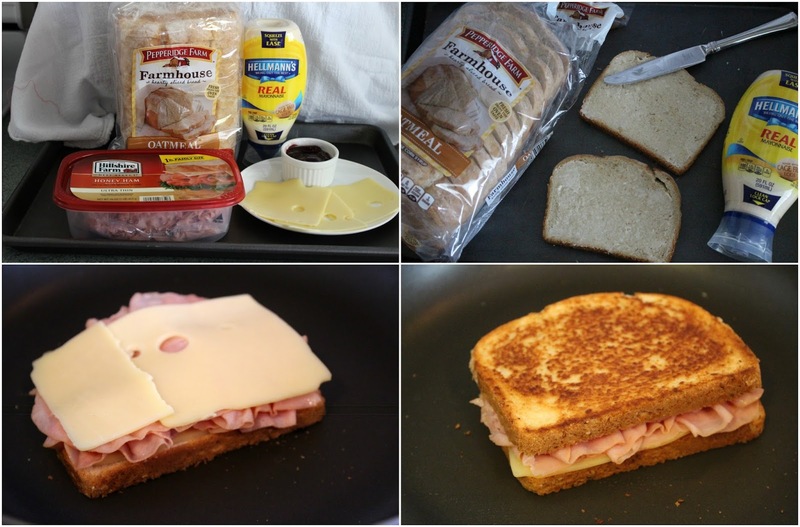 – Equally distribute and sprinkle Cheddar Cheese on top of the Ham. – Whisk Egg Beaters – or Eggs, if using – with Salt and Pepper, then pour over Ham and Cheese, leaving a little room at the top, because the eggs will bake and puff up slightly. – Bake for about 15 minutes, depending on how correct your oven temperature is, or until fully cooked and springs back to the touch. – Let it cool slightly before removing from doughnut pan. Repeat for second batch. – Cool completely before storing. 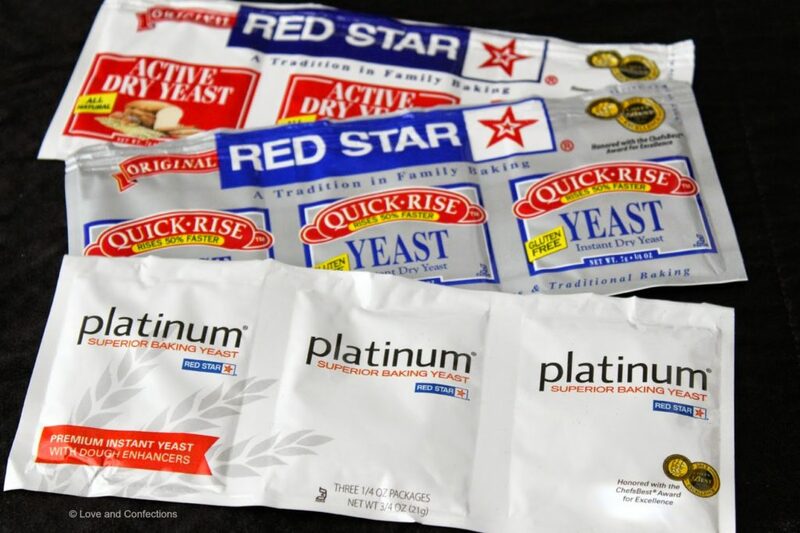 I recommend storing in zip-top bags in the refrigerator for up to 4 days or in the freezer for up to 2 weeks. – Toast and Butter mini Bagel. 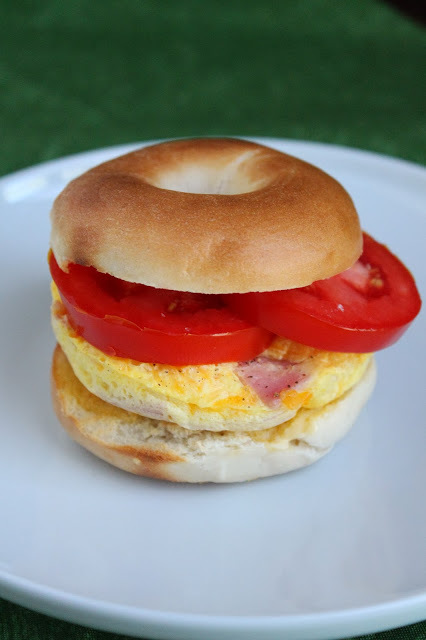 Layer Ham, Egg and Cheese “doughnuts” with Tomato slices and enjoy! Disclaimer: I received a Doughnut Pan by King Arthur Flour for review purposes. All opinions expressed are my own.